Zucchini Yogurt Pudding is a perfect summer snack that is crazy easy to make. A cup of yogurt can turn into an amazing healthy dessert in less than 5 minutes. Don’t worry, you won’t taste zucchini at all! This post has been sponsored by Dannon. All thoughts and opinions are my own. We are always in the mood for something refreshing these days. Is there anyone out there who is not? We often have salads with fresh produce for lunch and dinner but what about breakfast or a snack? Do you have a go-to recipe for the days when the temperature is quite high? Ready to hear our new obsession this summer? Please leave bias aside and listen. We LOVE eating a cup of zucchini yogurt pudding for breakfast. A wonderful way to start a new day! Okay I might have another cup as a snack in the afternoon as well. 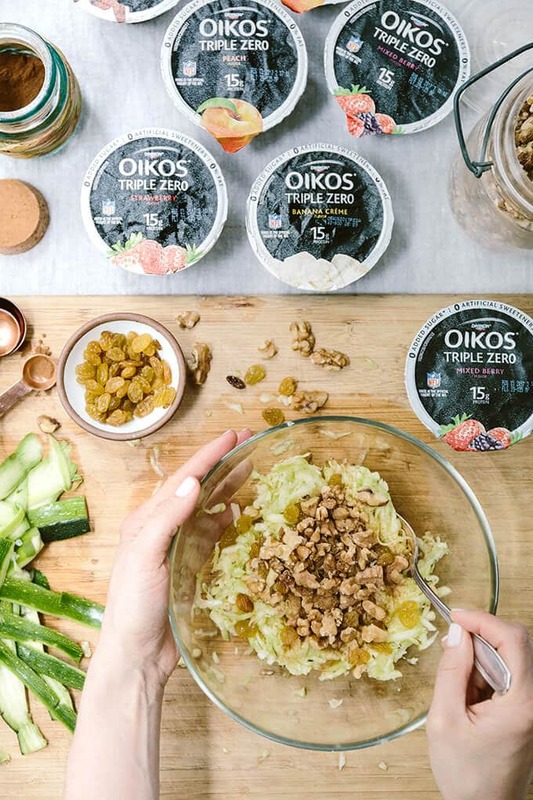 Here is what I make whenever I don’t have energy to cook or bake something on hot days: I grab Dannon® Greek yogurt, prepare an easy peasy zucchini mixture and combine these two right in the yogurt cups. One cup for each of us. Ready in less than 5 minutes. 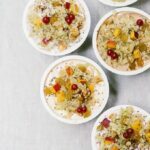 Don’t you think it’s great to serve this quick breakfast pudding in the yogurt cups? No big mess in the kitchen! I’m always sold by a recipe when there are no dirty dishes after a meal is served. 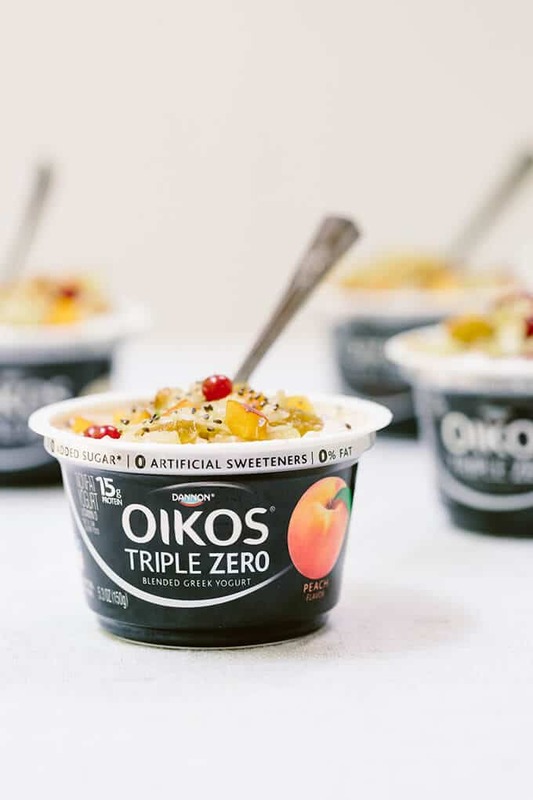 That’s why we always have some Greek yogurt on hand so that we can make this pudding on a lazy summer day. I love to use different flavors each time and our favorites so far are peach, strawberry, mixed berry and banana. You can find many flavors of Dannon Greek yogurt in the Dairy Aisle at Walmart. They are even offering a coupon for your purchase here. I know the name Zucchini Yogurt Pudding sounds weird but please don’t let the name discourage you! You won’t even taste zucchini in this creamy and flavorful pudding. One might even think that it’s apple. You heard it right. When I serve it to friends, they mostly think that I use shredded apple in this yogurt pudding. I think the fruit toppings make them think so. Did I tell you before how much I love to disguise zucchini in unexpected combinations? It always works great for the zucchini hater in the family (Hello my lovely husband!). Peel the zucchini so that it doesn’t give the feeling that it’s a zucchini. Shh! Keep it as a secret! 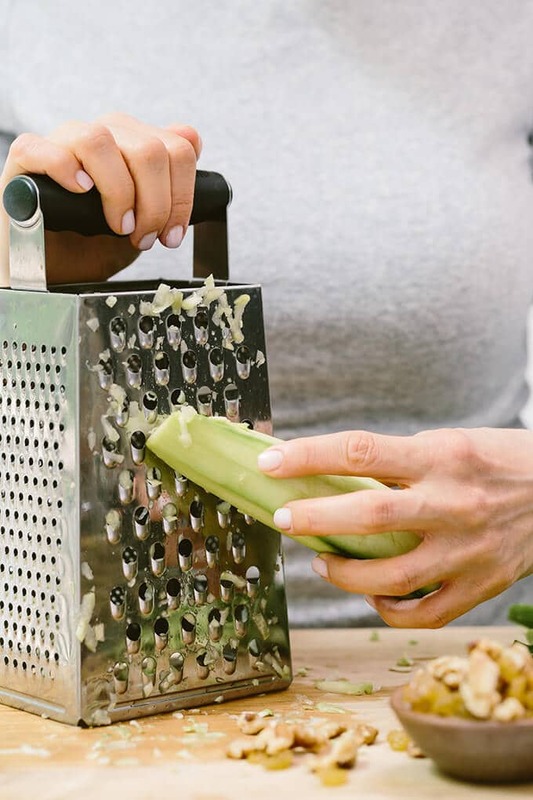 Shred it on a cheesecloth or paper towel and squeeze as much liquid as you can. 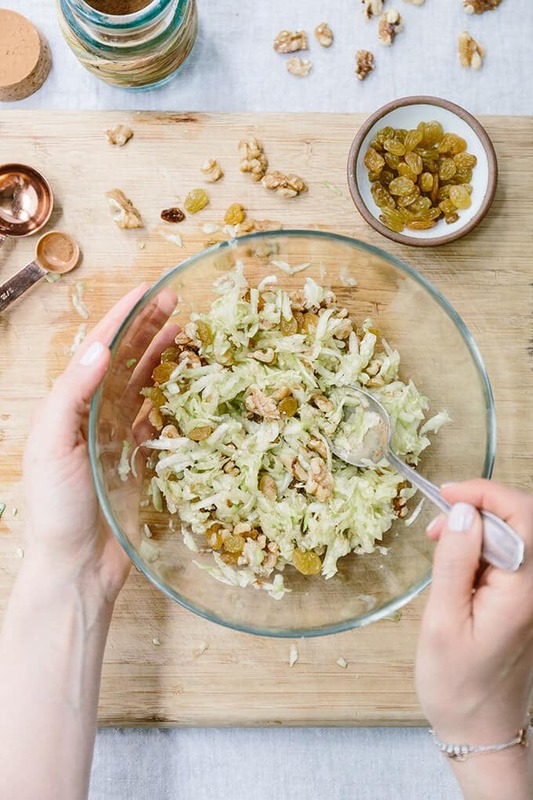 In a medium bowl, combine shredded zucchini, crumbled walnuts, raisins and cinnamon. 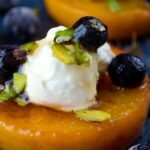 Because the Greek yogurt in this recipe is already sweetened, I don’t use any additional sweetener. If you want your pudding sweeter, you can add a drizzle of honey or maple syrup. I really don’t think this is needed though. No matter what flavor we use in the pudding, we love to top it with some fresh fruit. Berries and peach match perfectly with it. You can just go with whatever fruit you have on hand. I love to top my pudding with some extra zucchini, raisins and walnuts but it’s optional because we already have them in the pudding. We can make our pudding even better by adding some seeds on it. I use chia seeds mostly, but you can use flax seeds, sesame seeds or even pepitas. You know the sky is the limit. Are you looking for an easy recipe for a refreshing treat that you can satisfy all members of your family with? I mean something healthier that you can make at home. Make this unbelievably tasty no-cook zucchini yogurt pudding, top it with whatever you like and see how you can make your family satisfied with a few simple ingredients and with no real effort. Best part, you can make this healthy snack recipe even at work. Prepare the zucchini mixture ahead of time and put it in an airtight container. 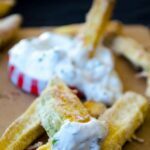 Take a cup of Greek yogurt with your favorite flavor and the zucchini mixture to work and combine them in the yogurt cup. Enjoy! 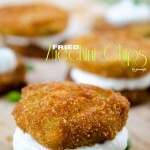 A perfect summer snack with Greek yogurt and zucchini. 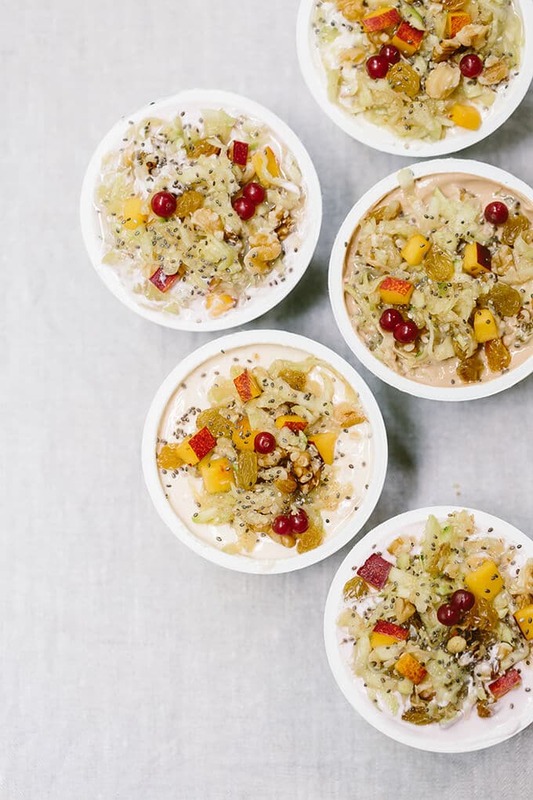 A cup of yogurt can turn into an amazing healthy dessert in less than 5 minutes. You won’t taste zucchini at all! In a medium bowl, combine shredded zucchini, raisins, walnuts and cinnamon. 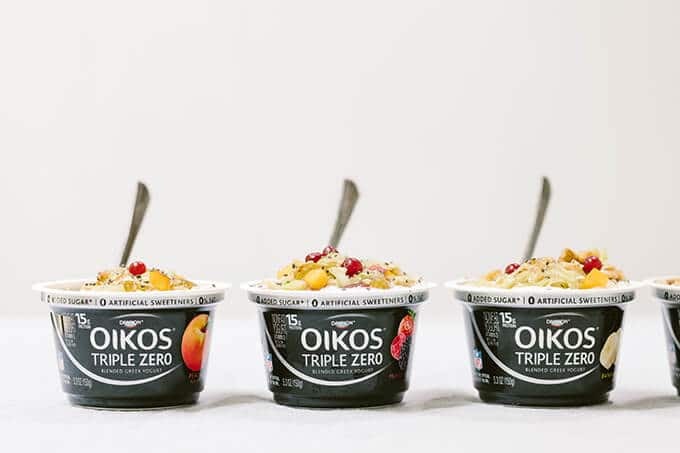 Share this evenly in each yogurt cup and give it a good stir. What a delicious and totally unusual dessert! I do use zucchini for cakes plenty of times but I would never have thought to put it into yogurt desserts. Super! 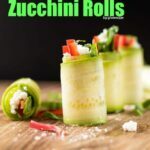 Zucchini is such a great vegetable that we can use it in a zillion ways. We mostly make a savory zucchini and yogurt dip, but tried in this pudding recipe this time and loved it too.